The Utrecht Introduction Time (UIT) started on Monday in TivoliVredenburg for more than four thousand students. This year’s theme: sustainability and diversity. The kick-off was filled with clichés, freshmen filled with expectations, cool breakdance, discomfort, and threatening thunder storms that overshadowed the event, but thankfully didn’t ruin it. “Whether Utrecht is a good city to study Molecular Life Sciences, you ask?” Freshman student Ivan lets his eyes wander around TivoliVredenburg where hundreds of young students are nervously trying to find their UIT-groups. “I’m not sure. You can read all sorts of reviews, but it’ll still be pretty much the same everywhere, I think. Utrecht is a great city, and I already know a couple of people here.” Although Ivan’s answer to my question of why he’s chosen Utrecht to study in may sound as if it lacks insight or substantiation, there’s some wisdom to be found in it. You can compare study programs till the cows come home, but you can also simply choose to go where it’s fun to be, and let the study program find you. Additionally, Ivan’s answer is anything but unique: most of the students present this Monday, when asked why they chose Utrecht, say the feeling they got from this city was the deciding factor. For Dennis, for instance, who thinks Utrecht is ‘leuk’ (fun, great, nice), who’s going to study journalism and is looking forward to an UIT week with ‘some fun drinking here and there’. 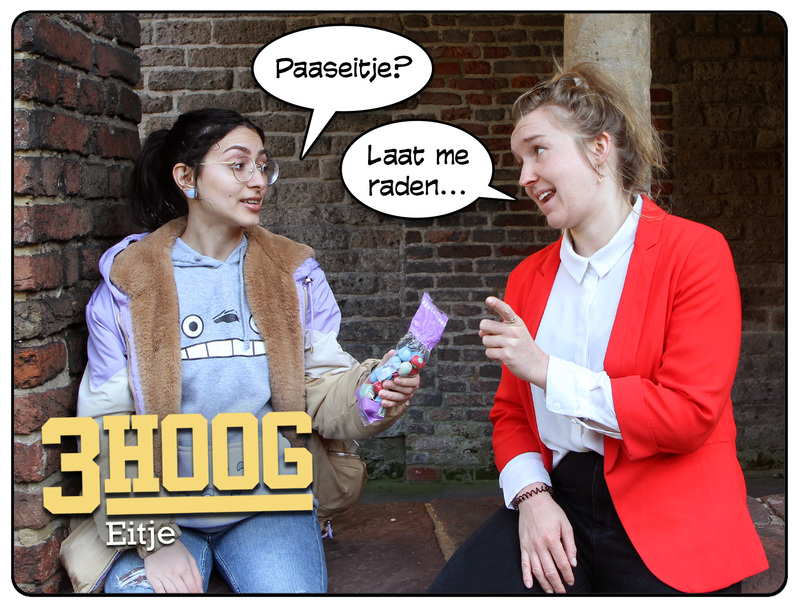 And for Andrea, a purple-haired girl who works in Houten and also thinks Utrecht is ‘leuk’. 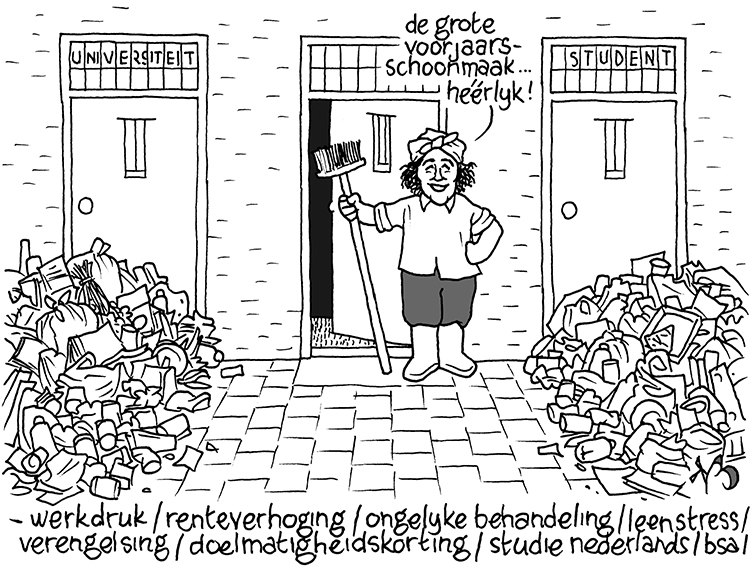 And for Maxim, a small girl who’s lost her group, is going to study hbo Law, and notes explicitly that the city of Utrecht is – you’ve guessed it – quite ‘leuk’. The UIT is the introduction time for around four thousand new students. Around two thirds of participants will study at the university, the others have enrolled at the university of applied sciences. This year’s theme is sustainability and diversity. The sustainability aspect of the theme is notable especially in this year’s schedule: Tuesday morning’s activity is ‘plogging’, or jogging and simultaneously picking up litter. Additionally, all UIT participants receive a reusable water bottle, and the program can only be found digitally – no program booklets have been printed. The diversity aspect is harder to spot. The organisation states there are several morning activities that are accessible to ‘broader audiences’, meaning: audiences who don’t like partying as much. Or: Muslims. In any case, it requires a high dose of imagination and good will to take this sustainability and diversity seriously. The freshmen are overwhelmingly white, there’s rarely a hijab to be seen, and it’s a far cry from sustainable to give everyone a miserable little backpack that’ll end up in the rubbish bin by tomorrow. Toe-curlingly awkward was today’s video message, in which the absent mayor Jan van Zanen introduces himself to the new students in a packed Ronda room in TivoliVredenburg. It’s a shame he didn’t show up himself, but it’s a travesty to hear his less-than-riveting speech filled with hollow phrases such as ‘leuke, gezellige city’. Those who’ve experienced kick-off events like this before, feel the clichés seep through to their bones regardless, and will no never want to hear anything else about terms such as ‘top city’, ‘gezellig’, and ‘Dom town’ (after the famous Dom tower) – not to mention ‘the time of your life’. But the event does have its fair share of good moments. The Come Correct Breakdance Crew, for instance, who open the event. With their incredible moves, interspersed with playful acts based on student life, they leave the audience amazed. Presenter and comedian Hassan El Rahaui is entertaining enough too, among other things when he mentions you can’t do drugs during the UIT, but you can do broccoli. Then there’s a quiz by Henk Kummeling and Tineke Zweed, the big bosses of the UU and HU. Moving around and jumping like presenters of a morning exercise TV show, they try to get the young crowd excited with multiple choice questions about the city of Utrecht. They succeed moderately at best, and the show recalls an image of two desperate parents trying to connect with their teenage children. Leaving high school feels like an amputation, regardless of whether you enjoyed your time there or not. If it was fantastic, it means you’re leaving everything behind and starting over at zero. Amputation. If high school was hell, you’ll pretend high school never existed in the first place. Amputation. If you look around the Ronda, you can spot three types of freshmen: those who observe, glassy-eyed, timid and expectant. Those who cross their arms, ostentatiously calling everything stupid; and those who start the week with frivolous, youthful enthusiasm. The beauty and tragedy of all this is that it doesn’t matter much what you do here. That no matter how you position yourself in this theatre, your past isn’t going to help you, and you’ll have to start over again. Back to Ivan. He’s gotten stranded with a group of freshmen. They’re a shift too early – in order to process the large numbers of students, the kick-off event runs three times – and they can’t join their UIT groups yet. The way Ivan is hanging around a corner of the room, lost, with his fellow lost ones, is characteristic for the event. They stare blankly ahead of themselves, exchange a few words on trivialities, and feel how every attempt at conversation dies instantly. They form a group without being a group. A team of orphans. It’s horrible to end up in a place you don’t know, with new people you can’t read yet, in a new chapter of existence you don’t understand, and on top of that, starting a week in which manical pleasure is the highest attainable ideal. Of course it’s good for something, and the pain of social discomfort is at its sharpest and loudest in these first few hours, and it’ll get better this week, surely – perhaps even fantastic, unforgettable – and it’s simply a matter of biting the bullet for now to start this new phase of your life. But still, it has to be said: this social discomfort is suffering. These moments are the fickleness of life. When the groups are formed, lunch is served. This was supposed to happen at the Paardenveld, but the threatening thunderstorm makes it each group for their own, and they spread out throughout TivoliVredenburg, with some even ending up in Hoog Catharijne. Finding shelter from the drizzle, which will turn into massive showers with thunder and lightning later on the day. Group mentors face their mentor children and yell “What’s the best group? !” into their ears, at which the children – because that they are – respond with uncertain smiles that “Group three!” is certainly the best - or any other random group number. And so it begins.